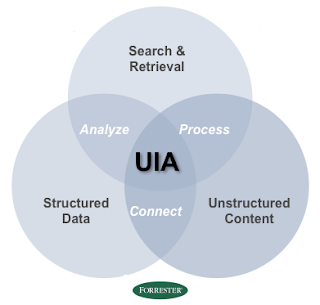 This is my second summarizing post on the excellent Enterprise Search Summit 2010 conference. See my earlier post for a summary of the workshop day, and first full day of the conference. View more presentations from Peter Morville. Social networking in many enterprises is EMAIL ! Therefore be prepared to search it, and 'social graph' it. Security came up again and again in this discussion and in the questions asked by the audience. In sophisticated environments, such as law firms where 'security by exception' is the norm, the search vendors tools are often lacking in their ability to provide security trimming of results sets that can cope with the requirements. Next up was Jeannine Bartlett presenting Early and Associates 'SIX' Metrics frameworks. SIX stands for Search Integration eXperience. I am not going to expand much on this session as its their proprietary methodology - but it was a very interesting session, so if your interested, give them a call ! My final session of the conference was "Sustainable search at Du Pont" by Alicia Shortlidge. Alicia has been involved with search at her company for ten years, and described herself as search team manager, project manager , search sys admin and developer ! Out of a central App Development Consulting Group team of ten, only Alicia and one colleague are full time dedicated to search, and yet they have built 18 specific 'search applications' on the same search tool platform (my notes seem to suggest Recommind again, but they are a bit scribbled !) which all use the same index. They are basically specific search applications for single major business units, developed to meet special customer requirements (under a charge back model). They also use a Google GSA for their intranet. Currently they have Librarians manually tagging content with metadata, but hope to move to an auto-classification model, freeing up the Librarians to do more effect QA / QC on the automated tagging. Security was a big issue again, with the use of the search engine as a 'security audit tool' - turning it on and finding stuff in unsecured and inappropriate repositories. "The broad category of enterprise search is dead. Today's knowledge workers demand role-specific, contextual search, wherever they work." So, there you go: 'Enterprise search is dead, long live, erm..... enterprise search...?" OK, so I like the general concept here, structured data and unstructured content brought together by connections and processes of search and retrieval. However I will have to do some more reading of Forrester's content before commenting further, but what do you think of this ? Use the comments section to let me know. So, in summary Enterprise Search Summit 2010 was an excellent conference with good sessions and even more so, some excellent networking opportunities with very intelligent practitioners; Ed, David, Jami and Christina, amongst others, thanks for improving my knowledge ! Lets not forget the vendors who attended, who were all very happy to discuss their products and search in general. I have to say, based on the other attendee's I spoke to, Microsoft if your reading, you missed an opportunity by not having any FAST people attending (although there seemed to be a surfeit of ex-FAST people !). Sorry, Jed, I certainly missed an opportunity to acknowledge your support! For those reading this now, I hereby avow that giving our search more prominence was a major theme of Jed's much appreciated report on our search last summer, before he moved to the corp. Thanks for promoting us at ESS too--did you really call us a poster child? ?